Jack Grosslein of Georgetown, MA, age 58, passed away on the morning of January 18, 2019 in his home, surrounded by his family. He was born on August 27, 1960 in Ithaca, NY to parents Marvin and Avis Grosslein. 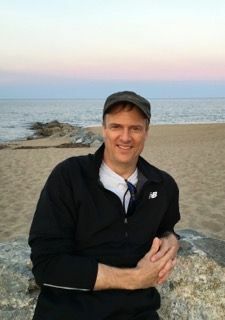 He graduated from Falmouth High School in 1978 and from Tufts University in 1982 with a bachelor’s degree in international relations. Jack Grosslein and Lyn Rys were married on April 8, 1989 in Ware, MA. Jack spent his childhood on the cape getting into trouble with his three brothers. For three years after college, Jack lived in picturesque Talloires, France where he worked on maintaining the 11th century Priory affiliated with Tufts. He utilized his fluency in French when working with foreign accounts in his career in consumer electronics and semiconductor sales. He went on to become a purchasing manager at Asian Atlantic Industries where he developed the business’s footprint in European and Asian markets. Jack’s passion for volleyball brought him to start the Men’s and Women’s Intercollegiate volleyball program while at Tufts, to play competitively in his early adult years, and to later coach his daughters and other youngsters in the sport. Jack had an exceptionally positive outlook on life that didn’t waver even throughout his fight with ocular melanoma. He used humor to touch people wherever his life led. Remaining active in various sports and leisure activities with his family – such as tennis, hiking, and skiing – was important to Jack. Forever a devoted husband and loving father, Jack will be deeply missed. Jack is survived by his wife, Lyn; his two daughters, Kate and Sara; his parents, Marvin and Avis; and his brothers, Ron and wife Louise, Jim, and Mark.